Mixon has won more awards for his BBQ than you can shake a smoking stick at. Want to take home the blue ribbon yourself? This is your book. Here, Mixon gives away 75 of his award-winning secrets. Drool-worthy pictures of smoked meats of all types make this book a winner, and recipes for marinades, rubs and sauces will inspire culinary fantasies. Mixon also helps readers find the best electric smoker in his chapter on equipment. Getting fired up? Excellent! This book will have you firing up the BBQ every night! This book is an old standby. Anything that has won the IACP/Julia Child Cookbook Award deserves a place on your shelf. 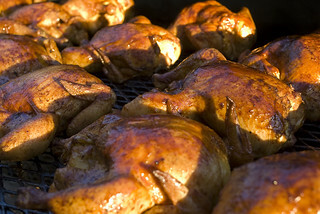 With over 500 recipes, it’s one of the larger collections of BBQ recipes available. The caveat of this book is that it’s aimed more at a beginner crowd. If you’re just getting started with your BBQ career, go for it! If you’re looking for something more detailed or even gourmet, explore some other options. Let’s face it, the title is apropos. BBQ is usually associated with guys and their grills. Cookston, however, is one of the world’s top pitmasters, and oh boy (I mean, oh girl!) is she a master! Here’s just a small sample of the to-die-for dishes you can cook up with the help of Cookston: Slow-Smoked Competition Brisket, Fire-Grilled Pork T-Bones with Hoe Cakes and Mississippi Caviar, and Grilled Pineapple Upside Down Cake. Yes, there is a BBQ desserts section! Need we say more? This is a comprehensive book filled to the brim with rubs, glazes and sauces. With multiple recipes for side dishes, it’s a great addition to your collection, as it allows you to plan meals made entirely on your BBQ, smoker, or in your backyard ground pit. Lilly writes an informative chapter on equipment including a barbecue smoker guide in which he walks readers through the best equipment for their needs. This husband and wife couple has truly given a gift to fans of authentic smoke-cooked BBQ. The cookbook is focused completely on the art of slow and smoke, and it delivers with 400 outstanding recipes. Some of those are not for the faint of heart or the impatient, but if you love meat that falls off the bone after being smoked for 12 or more hours, this is your book. You’ll be able to make just about any type of meat into a mouth-watering indulgence.